Possible Meanings: "Alternative “escape routes” in Gaia energetics have closed." 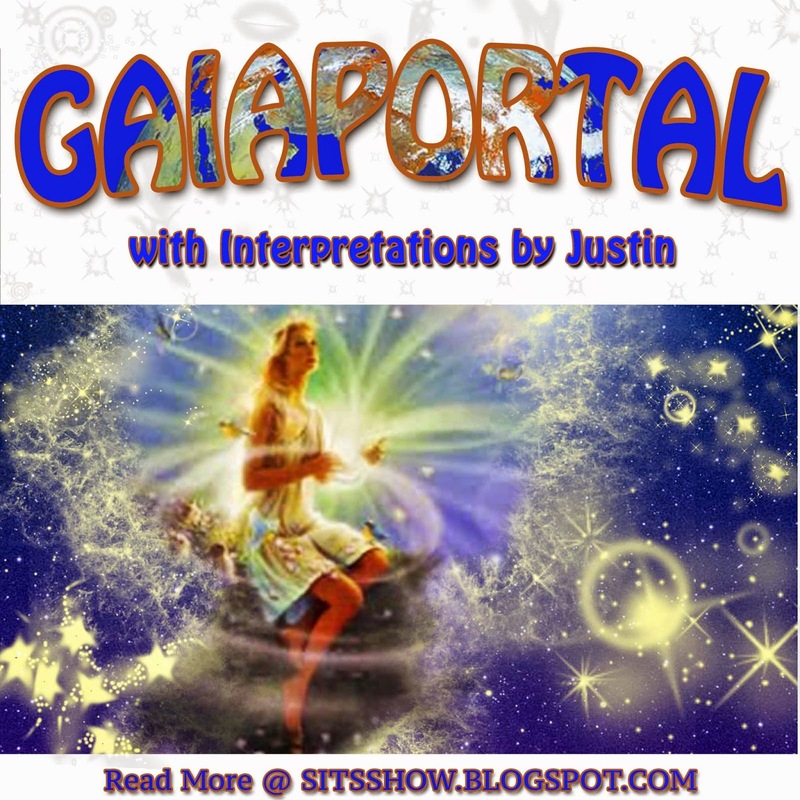 - This is one of the more interesting updates from Gaia portal. Here alternative "escape routes" suggests that those who did not want to be on Earth during an increased level of shifting have no choice but to remain. Possibly this relates to those who have 'left' the physical, which has been suggested by some researchers claiming that many people who are dying or are going missing exercised their free will choice not to be present at this time. If accurate, this resonates with GoodETxSG's data from yesterday suggesting several Cabal families have switched sides. It also references energetics which implies that the mindal spheres are also closed, dwelling in ignorance will no longer be an option, and this is underscored by other statements in this update. "Selection of Elevated Vibrational Inner guidance is key at this moment." - The use of the term selection here indicates a choice point, an active modality of free will. The term key suggest that this choice will have a major impact on one's personal evolution. Given that the truth transforms us when we choose to align with it, this suggests that making a selection to receive Elevated Vibrational Inner Guidance is essential or key to moving with Gaia's shifting energies. 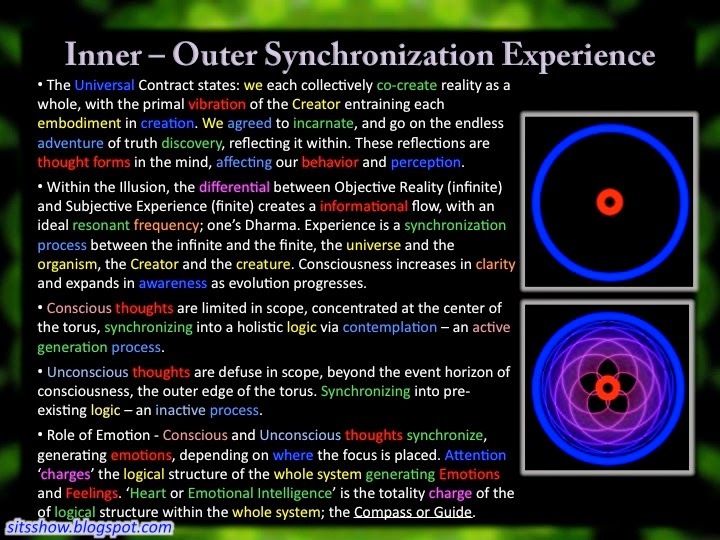 Of course this is all well understood within the principles of Entrainment, as a choice to receive these energies open's oneself to the synchronizing process of coherent reorganization. Much like focusing on an image or idea increases the resolution of it, aligning oneself to the truth, especially from within, greatly enhances this consciousness synchronization process. "Withdrawal from chaotic-appearing energies is recommended." - This statement seems to be the apophatic (stated in the negative) version of the preceding. 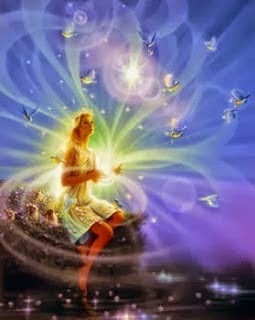 Above it is recommended that we align with the higher vibrational guidance within, and here it is recommended to withdraw from chaotic-appearing energies. I suggest that these to statements are two sides of the same coin, as making a choice to follow inner guidance is simultaneously a choice to withdraw from chaotic energies. Again all this has to do with waveforms and entrainment principles of synchronization. What we choose to focus our attention on is reflected within us. Slide 10 From Entrainment, Communication, Information and Evolution Presentation. One point of clarity I want to make is on the so called 'negative' information or things which often come up. Many people think that negativity is inherent in objects or ideas, for example the word 'problem' is often taken to mean something bad. But the experience of negativity is a self created thing as a result of how we have defined the object in our perception. A problem to one person, is a challenge to another person. As such, the choice to seek the truth and expand your understanding about what you label as negative is essential or key. This is exactly what is meant by the passages above. Therefore withdrawal from chaotic-APEARING energies does not mean ignoring the negative as is popularly believed in the bogus New Age movement. It means using your creative powers to TRANSMUTE the negative. For example, initially you may think 9/11 was negative, and when seeing things about it in your experience, it causes you to feel bad. As a result you may avoid anything that relates to it, but does this make your definition go away? No. The objective reality is inherently neutral, BUT if we choose to define something as negative, this creates a chaotic energy within ourselves, and leaving it as is means we literally become a resonator for negative energies. The Cabal know this all too well, and as such push all sorts of seemingly negative things on to the masses so they define them a such, and begin resonating with chaotic energies. Therefore, the choice to expand our definitions literally transmutes the negative experience, once enough of the truth has been reflected within it. Now we can look at 9/11 as a positive event, because it helped awaken so many people. Slide 11 From Entrainment, Communication, Information and Evolution Presentation. "Discerning Spirits know the Truth, and are not tricked." - Here again we have another statement reflecting the idea of contemplation and discernment being essential to knowing the truth so as to avoid being tricked. Contemplation is a creative act, allowing our conscious mind to find a logical relationship within 2 seemingly divergent ideas. 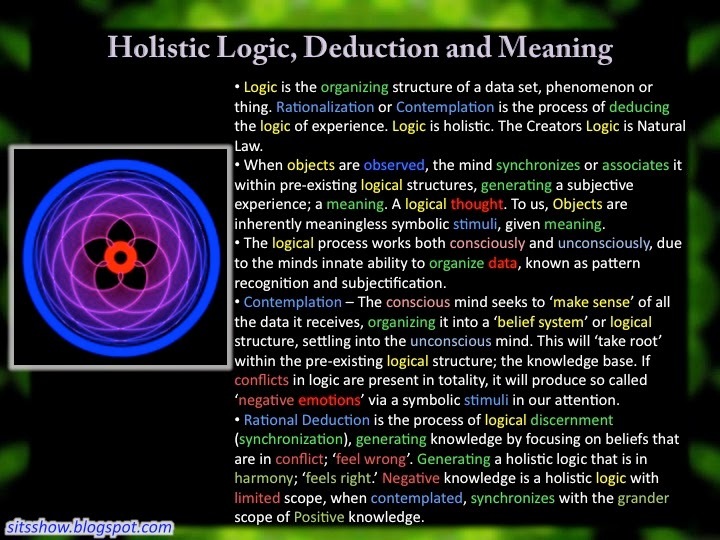 Logic, contrary to popular belief, is holistic. Logic seeks to take a series of observed phenomena and make sense of them, finding how they are related, developing a holistic understanding. Discernment uses the modality of contemplation to divine the truth. In other words, that whatever logical belief we have developed accurately reflects reality. For example, if we believe 9/11 was a horrific human sacrifice, and label this as negative, then it creates a chaotic emotional charge within, and tricks us into disempowering modes of consciousness. We may feel its all to negative to do anything about and become passive. Given the level of deception operating on Earth, I posit that as the energies increase, a great many things we once labeled as negative and attempted to avoid within ourselves (a type of self trick) will be charged with bad emotions, so as to draw our attention to them. This is the universal mechanism of offering transmutation to us. Much like pain draws our attention to things so we can take a corrective action, so called negative emotions are reflecting to us undeveloped and incomplete definitions in ourselves. Ignorance is definitely NOT bliss. "Inner growth accelerates from this time point." - Finally, we have a statement suggesting that those who have chosen truth, and are willing to discern, will experience accelerated growth from this moment onward. The synchronization process we discussed in relation to metronomes provides a basis for understanding this mechanism. During the synchronization process, the resonant frequency of the metronome board system slowly becomes more intense, which accelerates the correcting forces exerted from inertia. Eventually, the resonant frequency becomes dominant and over takes the individual frequencies of the metronomes, and a 'quantum leap' occurs. The more we choose to go within, contemplate our worldviews and beliefs, discerning and expand the truth in them, the greater our growth within will be. Additionally this will swing the pendulum of emotional charge from positive to negative.